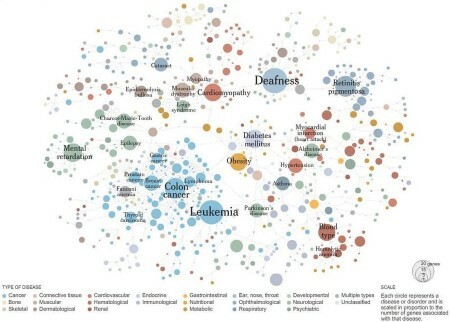  Mapping the Diseasome: The diseasome is a new way of looking at disease -- as a map of genetically-interrelated conditions. This model has already led to new insights into the nature of human disease. Scientists are finding that two tumors that arise in the same part of the body and look the same on a pathologist’s slide might be quite different in terms of what is occurring at the gene and protein level. Certain breast cancers are already being treated differently from others because of genetic markers like estrogen receptor and Her2, and also more complicated patterns of genetic activity. The research will also improve understanding of the causes of disease and of the functions of particular genes. For instance, two genes have recently been found to influence the risk of both diabetes and prostate cancer. Click the image below for the New York Times' interactive graphic. I find this model compelling for a few reasons. The first is aesthetic -- I like maps. I'm seduced by the heady concept of cartographic epidemiology. The second is that I like to see new perspectives on traditional paradigms -- this often results in breakthrough insights. Lastly, it's a new word to play with. Swift Enterprises Ltd. has unveiled a new patented synthetic hydrocarbon general aviation fuel—SwiftFuel—that is produced from biomass. SwiftFuel meets or exceeds the standards for aviation fuel as verified by nationally recognized laboratories, said co-founder John Rusek, a professor in Purdue University’s School of Astronautics and Aeronautics Engineering and research director for Swift. Rusek said the fuel can provide an effective range (distance between refueling) greater than petroleum while its projected cost is half that of the current petroleum manufacturing cost. General aviation means small prop planes, not jetliners, but SwiftFuel claims that they may be able to modify the results to meet commercial aviation needs. As with all breakthrough fuel news, it needs to be taken with a pound of salt, and questions remain about the biomass sources and production needs. However, if it works, and if they can make it work for commercial jets, it will radically change the carbon footprint calculus.  Heavy Weather Redux: Bruce Sterling, green courtesy phone: the tropical storm called "Erin" from last August turned out to be something rather odd -- a storm that strengthened into something very much like a hurricane... but over Oklahoma. 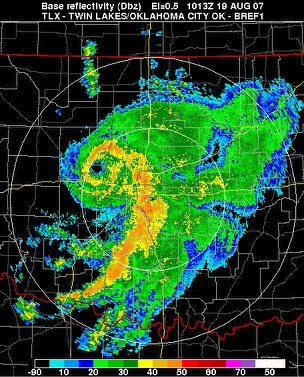 Over land, the remnants of the storm system looped up towards Oklahoma and reorganized, so much so that August 19 satellite images show Erin, its center very close to Oklahoma City, resembling an overland hurricane with an "eye" that it had never managed to develop over water. Meanwhile, the winds picked up far more than they ever had over the Gulf – reaching 50 knots sustained, 70 knot gusts – even as pressure fell as far as 995 millibars (far lower than when Erin had been an easily categorizable tropical storm). Now, months later, the National Hurricane Center has officially thrown up its hands and said "who knows?" The best that they can do is call it a "low"... but most low pressure zones don't kill seven people. Was Erin an anomaly? We'll find out in the coming summers, I presume. 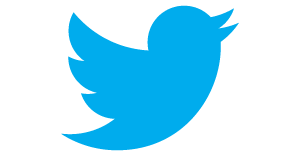  Welcome to the Ecoblogosphere: Recently, I had the startling opportunity to sit for an hour, along with a small handful of other green blogger types, chatting with the CEO/President/Chairman of Pacific Gas & Electric, the major energy company in California. The topic was, ostensibly, a new eco-energy blog to be rolled out by PG&E; in reality, we got to ask him about a wide variety of subjects, from smart meters (rolling out now, already updated to better tech than the first ones) to renewables to opposition to an energy-related proposition on the ballot. The answers didn't really go beyond what we might already have seen on the PG&E website, but I have to give them credit -- we didn't get any kind of management or pushback on the questions. Now, the new blog, Next100, is apparently open to the public. So far, it seems like a decent if as yet unspectacular effort, mixing new energy tech with topical enviro issues. Posting intensity is light, about once/daily, and the tone is a bit less snarky than Grist, a bit less earnest than Worldchanging, and a bit less lifestyle than Treehugger. It's notable, however, simply in that it's an effort on the part of a major energy company to engage with the blogging world. Not with press-releases (none of the front-page posts have anything to do with PG&E), not with greenwashing, but with "playing along." This isn't game-changing, yet, but it's a good sign. I'll be watching to see if this effort lasts. Erin's behaviour reminds me of a similar odd weather event that occurred over central Victoria in February 2005. General aviation fuel is essentially gasoline. It's 100 octane, meaning it is higher in octanes than septanes than normal gas, and called "Low Lead" even though it isn't, but it would run in almost any car just fine. Jet fuel, or Jet A at least, is primarily Kerosene, closer to fuel oil than avgas.